My design used scraps of green cotton yarn (Lily Sugar ‘n Cream – dark pine) and a size G crochet hook. Stitches used: CH (chain), SC (single crochet), TR (triple crochet), HDC (half double crochet), SL (slip stitch). Directions in US crochet terms. I began using the “magic” loop technique crocheting 6 SC and joining with a SL in first SC. Slip stitch (SL) in next stitch then crochet 3 CH, 1 TR, 1 HDC, 1 TR, 3 CH, 1 SL (all in that same stitch), SL in next stitch, SL in next stitch then crochet 3 CH, 1 TR, 1 HDC, 1 TR, 3 CH 1 SL, SL in next stitch, SL in next stitch then crochet 3 CH, 1 TR, 1 HDC, 1 TR, 3 CH, 1 SL, SL in next stitch, CH 5, skip first chain and SL in remaining 4 chains to create stem. Slip stitch back through the stitch you used to crochet 5 chains and fasten off. You can just finger shape the leaves on your clover or you can steam them. 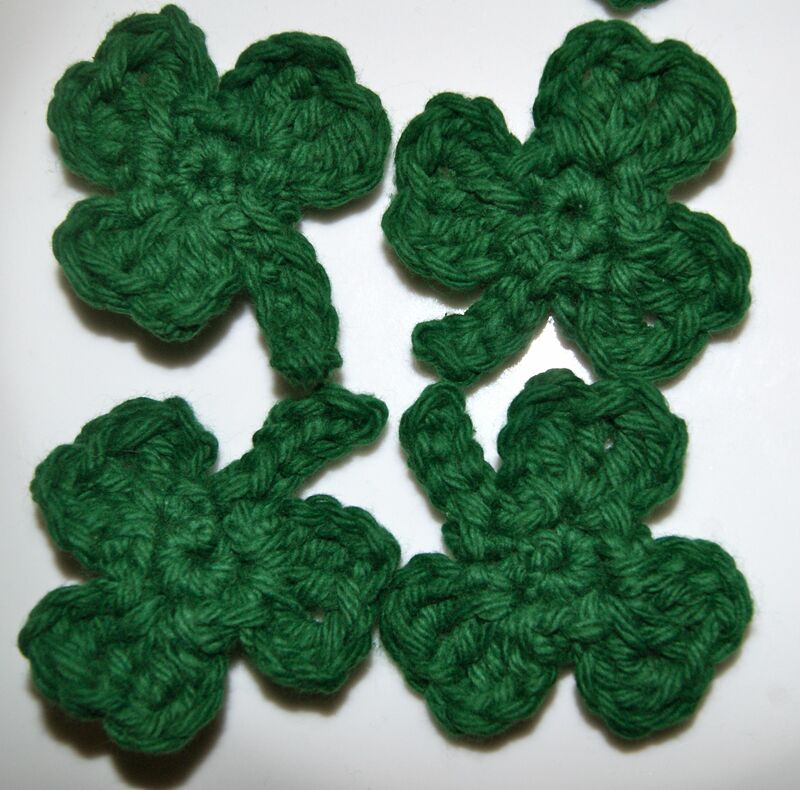 These little shamrocks can be used for a variety of things – add a pin back for a lucky brooch or lapel pin, accessorize a headband, make into a zipper pull, turn it into a bookmark, accent for a napkin ring/placard, scrapbook embellishment, cardmaking accessory – just be as creative as you can! !